If you love coffee, red wine, berries, Coke, and other dark foods and drinks, odds are, your teeth will start to show it over time. It’s unfortunate that some of our favorite foods can stain our teeth and turn them yellow, even if we brush and floss religiously. However, the good news is that there’s an easy fix: teeth whitening services and take-home teeth whitening kits. At Trillium Dental in Ottawa, we offer many different cosmetic dentistry services to help patients regain confidence in their smile, from Invisalign® and porcelain veneers to professional-grade teeth whitening gel. Teeth whitening treatments and techniques have come a long way in the last few decades, and dental clinics now have access to the best teeth whitening technology available today. At Trillium Dental, we use Zoom!® whitening gel and specialized teeth whitening lights, which can bleach your teeth up to nine shades whiter in an hour (three 15-minute sessions). We also understand that bleaching your teeth from the comfort of your couch is more appealing to some patients, which is why we offer take-home teeth whitening kits for those who would rather do it themselves. That being said, here is a quick and easy guide for whitening your teeth at home! These days, you can find teeth whitening kits nearly anywhere — but before you order that cheap teeth whitening kit online or try some kind of DIY teeth whitening method, make sure to do your research so you know what to expect. The internet is full of knock-off teeth whitening kits that aren’t very effective and are difficult to use by yourself, so if you’re looking to dramatically improve the look of your smile, it’s best to pick up a teeth whitening kit at your local dental clinic. At Trillium Dental, we are happy to provide you with a teeth bleaching kit so you can do the teeth whitening at home, so give us a call or stop by our Ottawa dental clinic if you’d like to try it for yourself! The most important thing to remember when whitening your teeth at home is that you are dealing with chemicals that should not be consumed or come into contact with your gums, which is why these kits require that you only squeeze a small amount of gel into the teeth whitening trays. Often, people will neglect to follow the instructions in their teeth whitening kit and put too much gel in the trays. This can cause you to accidentally get teeth whitening gel on your gums if you’re not careful, which can sting a little and cause irritation. That’s why many patients opt to spend a little extra on a professional teeth whitening treatment — our dentists have the skills and experience necessary to do it right and produce great results without harming you. 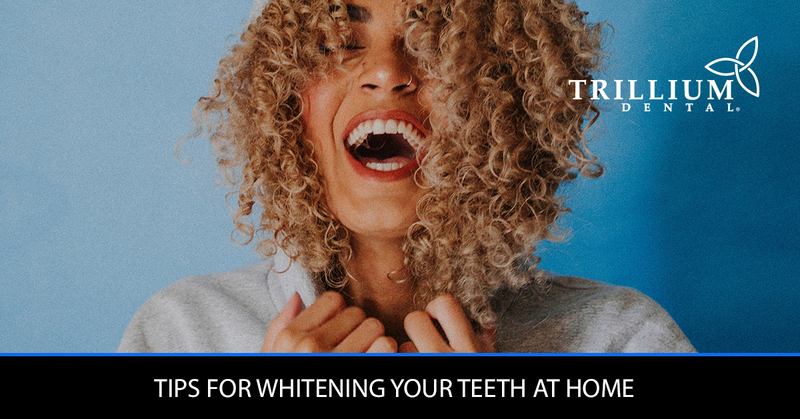 When you’re bleaching your teeth at home with teeth whitening gel, make sure to only leave it on your teeth for as long as instructed, as your teeth can become sensitive if you leave it on too long. This can easily make the experience unpleasant. If you’ve invested in one of the best teeth whitening products available online or at your local dentist’s office, you shouldn’t have to leave the teeth whitening gel on any longer than it says to in the instructions. Many of the best teeth whitening kits will also come with an LED light that you can shine on the gel to enhance its effectiveness, so take this into account when you’re tempted to leave the teeth whitening gel on longer than instructed. Once your time is up (usually one hour), take the teeth whitening tray out of your mouth and gently remove the gel. You can do this with a cloth, tissue, or whatever else came in the teeth whitening kit, but no matter how you do it, just make sure to get as much off as possible so you don’t consume any and get an upset stomach. Most teeth whitening bleach will continue to whiten your teeth for a while after it has been removed, which is another reason why you shouldn’t leave it on longer than the instructions recommend. Rinse your mouth thoroughly after use so you get as much teeth whitening gel out of your mouth as possible, and don’t forget to wash the trays so they are ready to go next time you decide to whiten your teeth at home. Ready to try whitening your teeth at home? Drop by Trillium Dental in Ottawa today to pick up one of our take-home teeth whitening kits! We look forward to seeing you.